Fully equipped polycanvas picnic backpack for four with blanket from our Houndstooth Collection - features a detachable wine carrier and roomy Thermal Shield insulated cooler section at the back. 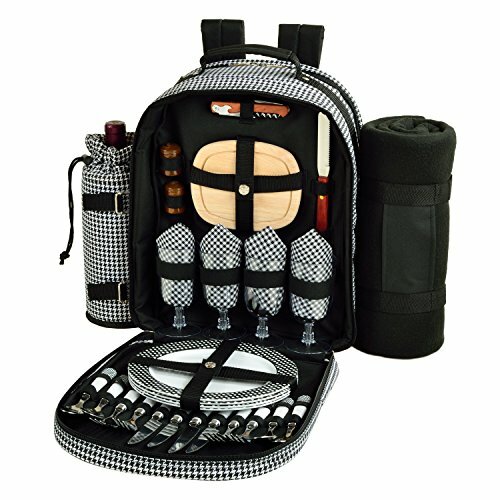 Includes a combination corkscrew, hardwood cutting board, cheese knife, wooden salt & pepper shakers with non spill tops, acrylic wine glasses, coordinating 9" melamine plates, stainless steel flatware, napkins and large fleece blanket with carrier. This picnic pack has a classic look, constructed of 600D polycanvas. Designed and assembled in the USA. Lifetime warranty.